The latest and greatest Vivo Nex Dual Display in Australia is sporting an innovative form factor of both front and back screen. The handset is the first from a Chinese smartphone brand to house dual Super AMOLED screens and 3 rear cameras. The front camera has now been removed in order to offer users all-screen symmetrical appearance – devoid of a wide or waterdrop-like notch or selfie hole. 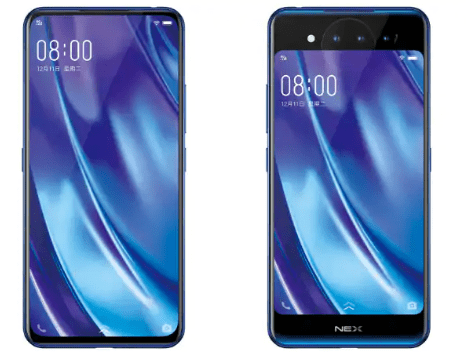 The Vivo Nex Dual Display specifications include Android 9.0 Pie operating system, 2 display panels – a 6.39-inches full-HD+ Super AMOLED screen with a maximum resolution of 1080 x 2340 Pixels out front and a 5.49-inches Full HD (1080 x 1920 Pixels) Super AMOLED screen outback. It’s powered by an Octa-core Qualcomm Snapdragon 845 Chipset which is paired with 10GB of RAM and 128GB of onboard memory. In terms of optics, Vivo Nex Dual Display Edition is housing a triple-rear camera configuration – 12MP with OIS + 2MP + TOF 3D stereo. And out front, you’ll see not even a single selfie snapper thanks to its dual display. There is 3500mAh non-removable battery under the hood alongside support for 22.5W fast charging. Connectivity options on Vivo Nex Dual Display include 4G LTE, Dual-Band Wi-Fi, Bluetooth, GPS, USB Type-C and a 3.5mm headphone jack. The smartphone is already up for pre-ordering in China whereas officially arrive shelves in China, India, Australia, and other regions on December 29. As far as Vivo Nex Dual Display Price is concerned, it’s coming out at CNY 4998 which is approx. $1004.